The reason for this was to participate in a ‘Just Play’ Inter School Tournament. 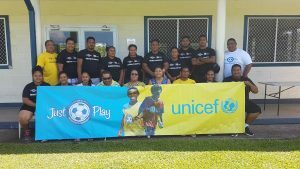 Children in classes from year 1 through to year 8 took part in the one-day tournament, which was organized by The Football Federation Samoa (FFS) with the support of schools. Even though all the participating teams tried very hard to win, winning was not the main focus of the tournament. As the name ‘Just Play’ suggests the main focus for the children was to participate and have fun. As a result of the tournament the participants were able to learn more about football, enjoy interacting and competing against students from other schools, make new friends and have a good work out while doing it. A total of 75 teams participated in the tournament, which was divided into four age group competitions. These were year 1 and 2, year 3 and 4, year 5 and 6 and also year 7 and 8. The teams were also divided into groups of boys and girls. At the conclusion of the tournament, Peace Chapel Primary School proved too strong winning both the boys and girls Year 1 and 2. Le Amosa ended up winning the boys and girls year 3 and 4. Samoa Primary managed to win both the boys and girls year 5 and 6. Vaivase Primary School won the Girls 7 and 8 and Magiagi Primary School won the boys year 7 and 8. Le Amosa School won the last award of the day, which was the Fair Play award. The ‘Just Play’ program is grassroots program, which promotes physical activity for primary-aged children while encouraging community involvement and healthy living. 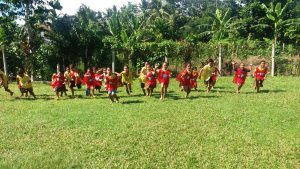 It was launched in Apia last year and has been introduced into 69 primary schools and 25 communities round Samoa with approximately 17,000 children participating in the program. Photo Caption: Primary School children having fun during last Fridays Just Play Tournament. 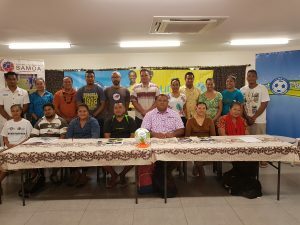 Previous Post Samoa Men’s National Team Trails. Samoa Men’s National Team Trails.